How great will you feel when you know you have found a trusted 'Promotional Partner' to provide an independent promotional resource to enhance your business. Simply, ask for a free quotation to allow us to demostrate our service and see how we add value to your business. When looking to reduce costs and improve the quality of your workwear and merchandise Blue Mole will not let you down. As an independent company we source the best products and ‘compare the market’ to meet your needs. Our clients include sole traders, SME's 'High Street' names and PLC’s - all wishing to increase brand awareness with quality products. We have built a reputation for providing quality products, on time, within budget and ensure our recommendations ‘tick all the boxes’ to meet client expectations. 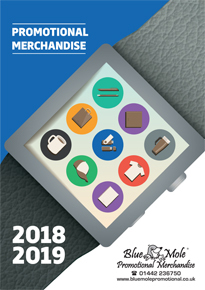 We provide quality, practical and durable products with a high perceived value, to promote your brand in a positive way by providing memorable merchandise that clients will want to use and display time and time again. Our aim is to support our clients, increase brand awareness, maximise promotional potential and to ultimately save you time and money. Blue Mole Promotional is a trading name of Blue Mole Limited. Images used on this site may include logos of companies and organisation that we may or may not have supplied directly and they are published simply to show the promotional products available.